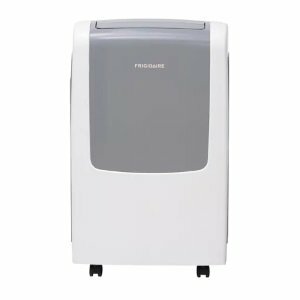 If you are considering portable air conditioners by Frigidaire, Frigidaire portable heat pumps may be a better choice. Also, if you are looking for an appliance, or a more practical portable heat pump to warm up your room economically, have in mind to check out Frigidaire air conditioners with supplemental heat. We are reviewing the main features of Frigidaire portable heat pumps here, to give you initial information about models, differences between them and user experiences. There are four models of Frigidaire portable air conditioners with supplemental heat. All of them have the same 4100 BTU heat output, so we are going to see the other features that would help you to select the unit for your needs. Let's start with the most powerful one. With 14,000 BTU of cooling power, Frigidaire FFPH1422R1 is the most popular and the top rated model in Frigidaire portable heat pump ranges. This single hose unit is suitable for heating and cooling a space up to 700 sq. ft. There are five modes to choose between – Cool, Heat, Fan, Dry and Sleep, with three speeds in cooling and fan modes - allowing great comfort and climate for any homeowner. Customers are usually asking about the hose using in certain modes. It is up to the model and you must read the User manual. Frigidaire FFPH1422R1 comes with the remote control, programmable timer, antibacterial filter, swing air direction operation... Energy efficiency ratio is 8.9 and customers are happy with their units, especially the 14,000 BTU cooling power. One observation, however, is worth to be noted. The unit is “bigger than expected”, so be sure that you have checked out dimensions carefully, including the hose. Portable does not always mean small. Some customers claim that hose is not long enough to reach the window in their house. For the price about $600 you will get a ready to use well designed freestanding appliance, with casters for easy moving, a hose and window kit. At the same price and with same features you may choose the unit in black color (ask for model FFPH1422T1). With less cooling power than previous model, Frigidaire FFPH1222R1, with the same look as the above model, is designed to cool or heat a room that is up to 500 sq. ft. The 12,000-BTU unit is packed in the same housing, so you will not see any difference, except a little less weight. Frigidaire FFPH1222R1 cools and heats well enough the smaller space and its dehumidification power is significantly lower. There is yet an advantage – with maximum noise level of 53.6 dB, compared to 55 dB of previous model, FFPH1222R1 is quieter. All the other features are same, including controls, options and mounting kit in the package. The price is $549 and if you prefer black cabinet ask for FFPH1222T1 model. This model of the Frigidaire portable heat pump is little different from the previous one and the price is same. The cabinet is slightly bigger and heavier. Here we have a three-speed fan in cooling, fan, and also in heating mode. Dehumidification ratio is lower. If air-drying is important to you, think twice – 2.7 pints per hour compared to 3.8 pints per hour offered by the first, 14,000-BTU unit is the significant difference. If you want to cool or heat literally one small room, consider Frigidaire FRA09EPT1. This is the least powerful Frigidaire portable heat pump with only 9.000 BTU output and $499 price. The housing is same as the previous one Frigidaire FRA12EPT1, but keep in mind that many features, from dehumidification to energy efficiency ratio, are inferior. As a conclusion, it must be said that heating is not the primary function of this kind of appliances. Customers are satisfied while using Frigidaire portable heat pumps for heating in not so demanding conditions. 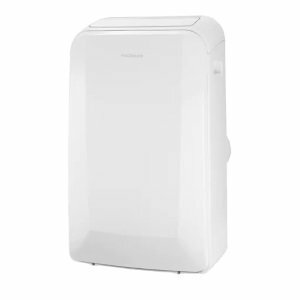 Frigidaire portable room air conditioners with supplemental heat are only $20-$50 more expensive than equivalent units without heating function, and if you have a moderate requirements, additional expenditure can be justified.